With the Magento Featured Products 3 extension, you can display a specified number of products using a grid layout based on thumbnails of your popular products. Inserted in the predefined position or via layout, CMS, and widgets, your featured products block can be displayed at any page of your Magento store. Having chosen the product slider mode, you are offered several animation switching effects which can be specified for each block individually. Make products presentation more lively and memorable in your store! Magento Featured Products 3 is very flexible for configuration. Just few clicks and all block parameters are defined in accordance with the insertion place requirements. Thus you can easily enable product name, price, and short description, hide the "Add to cart" button, specify the block style, size and even define animation speed. The Featured Products 3 extension allows displaying random products from any categories of your store. The block with this option will be perfect at the Login and Home page of your Magento store. In the featured products block, you can display highest-rated items that have received an essential number of total customer ratings. It is most appropriate to display it at the Category and Product pages. 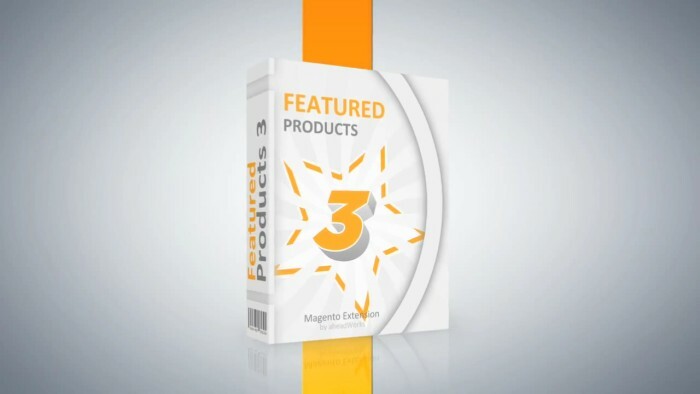 With the Magento Featured Products 3 module, you can easily promote your just added products. It is an ideal automation option for the block displayed at the My Account and Home pages. The block with the most frequently bought items will definitely improve your up-selling. This option is especially effective when chosen for blocks displayed at the Shopping Cart and Checkout pages. If you want increase your cross-selling, select the most reviewed items for your featured products block. It can be equally efficient both at the Category and Product pages. Featured Products 3 allows making your up-selling block category-related and display items from the current category only. Using the Featured Products 3 extension together with the below Aheadworks products, online merchants get more valuable insights. Let customers add products from the promo block to the shoppingcart without page reloads. Show product labels in the featured products block. We had an issue that was caused by a conflict with a third party extension (third party extension's fault which we did not know before). Aheadworks team checked and solved the problem within 24 hours - excellent. Thanks! This extension worked fully just out of box and its intuitive settings made the store to be able to appeal customers within few minutes. Works like a charm and if you need help, support is extremely helpful and fast to look into your case. Very good extension, will be very useful for us. Provides us with a fantastic way ts make moo showcase our best products and will help ure money. Good support. A wonderful promotional tool, simple and flexible at the same time. With the app's automation setting, it's really easy to have your top products spotlighted, and the slider representation looks quite appealing. Great module for attaching related products to landing pages. Very easy and intuitiv block management and quite easy to customize / adapt it to your needs. Works perfect. As an agency, we've implemented this module for a number of clients. They have always been very pleased with the added marketing potential this module brings. As with many modules, this brings the client much closer to the functionality they want but some customization is still required. Overall, this a solid module. We use this on both our frontpage and category pages. The moving slideshow makes the page and the entire store "come alive". Good upgrade to original Featured products we had installed. Much easier to attribute products to categories/blocks. Can be a bit slow to load product collection if using Top Seller attribute on a category with many items. Apart from that - great! Permet d'ajouter facilement un produit dans le panier, directement à partir de n'importe quel blocs. This extension enables every pages in Magento into shopping cart. Even in CMS pages, you can add products you want to show to your clients. Only drawback is that button is not integrated with the template design. and very versatile. Great to use all over the store. Très facile à installer et très complète. Cette extension est exactement ce dont j'avais besoin. We're using it on many places - great to promote easily und automatically our products. One thing is missing: creating a block with products with a special price. I just upgraded my extension after upgrading magenta 1.5.1. to 1.6.1. As usual everything works fine. I use FP3 mostly on top of my catergorypage with a horizontal view in slider mode. awesome. You can use this to put products basically anywhere on your site. Just install and tell which products you want to show where. Very simple and useful for any shop. This is a go to app for all my clients. This extension just keeps getting better. Easy to install and a labor saver in maintaining a site. This is a fantastic extension! Featured Products saved me countless days of agonising effort configuring upsells, etc, and with the Random feature you always get fresh content. The team at aheadWorks were great, always available to help out & make sure the product gets deployed. Good extension. That's I expected. If the product position can be set, It's better. The evolution of "featured products"
Good flexibility and pre-defined options. Uses proper Magento-style coding and allows me to integrate into the store smoothy. Only complaint is that I can't use an image attached to a product that has the Excluded flag turned-on. I'd like to be able to upload banners to the Product that are not displayed on the Product page, but can be used in the Featured Products slider. Exactly as I expected. Easy installation and easy to work.